This past weekend I had the opportunity to go see The King’s Speech with a group of new friends. The film chronicles the story of Prince Albert of Wales’ (Bertie, to close friends and family) unexpected rise to the throne as King George VI. If you haven’t seen it yet, I recommend you go check it out. Not because it just took home a Golden Globe and has some good Oscar buzz, but because it holds some good lessons for marketers. The film shows the struggle Bertie goes through while trying to conquer something marketers, themselves, often struggle with — creating a compelling, unified voice. There were a lot of strong lessons for marketers to take from The King’s Speech, here are four that really hit home with me. To rule, you must step up AND speak up. Bertie was never supposed to be King. He became King unexpectedly after his brother, King Edward VIII, abdicated the throne to marry someone who could never be Queen – a twice-divorced American (gasp!). When it was made clear that his brother was unwilling to step up to his duties, Bertie knew he would have to. Not only would he have to rule Britain, he would have to speak to Britain. With Bertie’s stutter, I do believe it was the latter that was more terrifying. But how many brands and marketers can relate to Bertie’s fear? How many people took a job not realizing it came with the hidden position of being the company’s spokesperson? How many people started businesses not realizing they’d have to get vocal on blogs and social media sites? But suddenly, the rules changed and here you are. And just like Bertie, you’re hesitant to step up. But that’s just too bad. Because you have to and you can’t let fear deter you or your brand from your destiny. 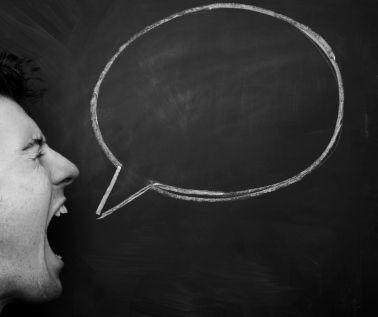 While speaking up can be scary for a brand, it’s a requirement to rule. Whether you want to be a leader in your country or just your neighborhood, people have to hear from you. They need to see you and what you stand for. You need to give them something to rally around. You must suit up, step up, and speak up. Developing your voice takes work. Like many brands, Bertie didn’t arrive on the scene with a perfect voice or a perfect message. He stuttered. His voice was fragmented. He knew that he needed help developing his voice and finding its natural power, so he agreed to work with speech therapist Lionel Logue. With Logue’s help, Bertie was given the tools and tricks he needed to get his words out and better communicate with his audience. He was also given a greater understanding of his impediment, the power of his voice, and why it was important that he not remain silent. All of this knowledge helped him to work through his issues and present a unified voice to the people of Britain. So, you probably don’t need a speech therapist. But you may need a social media company. Someone who can step in and give you the same type of understanding that Logue gave Bertie and that allowed him to be a great leader. As a brand, you need to define your voice and clarify your message in a different way. You may be able to physically get the words out, but you need to understand what you stand for, why you’re there, and how becoming a social brand is going to help you achieve your larger goals. A social media company can help give you the tools you need to do that if you’re worried your voice is feeling a bit fragmented. You just need the same courage Bertie had to ask for help. One of the most powerful scenes in the movies shows Bertie, now King George VI, preparing to address Britain in his first war-time speech. After much rehearsal, King George VI is led to a tiny room, just big enough for himself, Logue and the microphone through which he’ll give his speech. As King George prepares himself, Logue gives him one set of finally instructions, “Forget everything else, just say it to me”. In that moment, Logue was his only audience. He was the only person who mattered. Brands need to know their audience and must remember to only speak to that group. It doesn’t matter if the peanut gallery is in tune with your message. All customers are not created equal and those people don’t matter to your brand. You can’t reach everyone. Trying to will just dilute what you’re saying and its overall effectiveness. Just focus on your audience, forget everything else. Lionel Logue isn’t your average speech therapist. Actually, it turns out he’s not a speech therapist at all (shh), but that may be why he was so effective in helping King George VI battle his stutter. Lionel wasn’t afraid to be odd, to be unconventional, or to offend people with his tactics. He believed in their power and that was all that mattered. That’s how he attracted clients and what made him stand out. There’s a reason that when the King’s wife was looking for a speech therapist, Logue’s name was the one uttered. Stop trying to fit in. Stop spewing out completely bland messages in fear that saying anything interest with offend someone or will anger people who mean nothing to your brand. People remember the peculiar. They identify with the peculiar. Don’t be afraid to take the road less traveled. It turns out the bumps actually make things more fun. Being weird is more fun. Those are some of the marketing takeaways I came away with after viewing The King’s Speech. If you haven’t seen the movie, I recommend you find time to squeeze it in. We could all use a reminder about the power of voice.